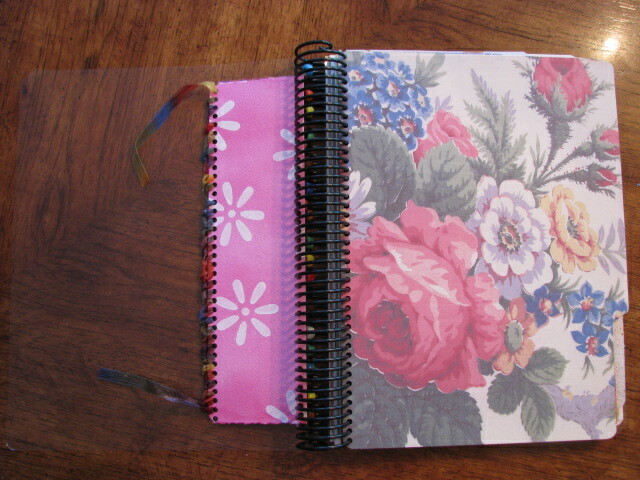 ← And the lucky winner is…..
For the past few weeks I have been thinking of how I want to create a recycled journal. 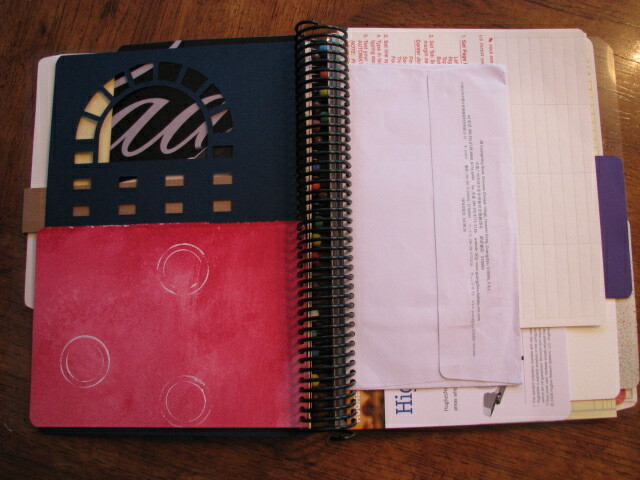 The original idea, an altered notebook came from Ingrid Dijkers. I have been fascinated by this concept of creating art re-using materials that would end up in my recycle bin or worse, in the trash. So, today I started my journey on artful recycling (I just coined this term!). Here is what the front looks like. The ribboned piece is an original background paper that I made. 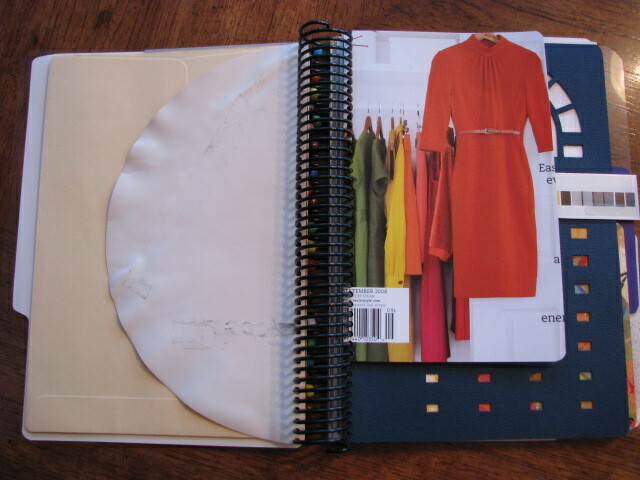 Here is an up close picture of the binding. I bought a Rubi-Coil machine earlier this year and it has turned out to be one of my favorite tools. I added some left over beads as I threaded the coils through the pages. 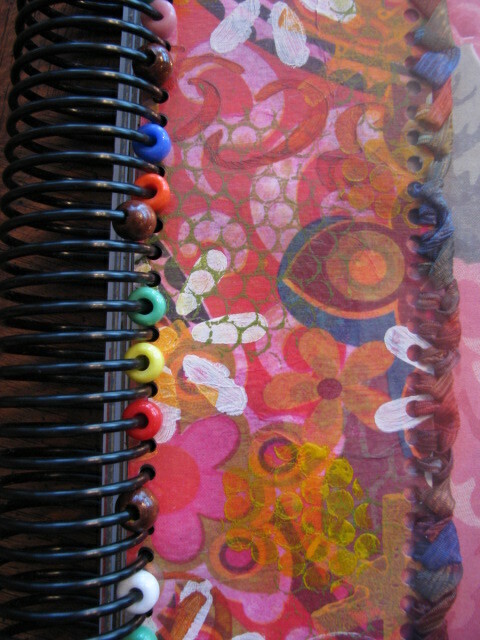 I will be adding ribbons and yarns to the coils as I work in the journal. 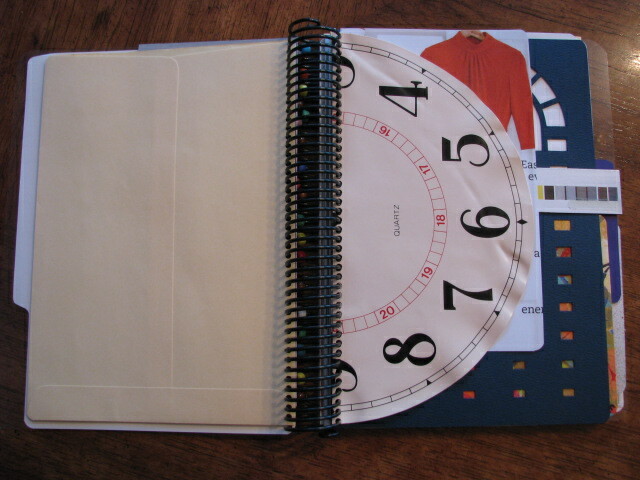 The cover is an old transparancy and the first page is the front of a file folder. 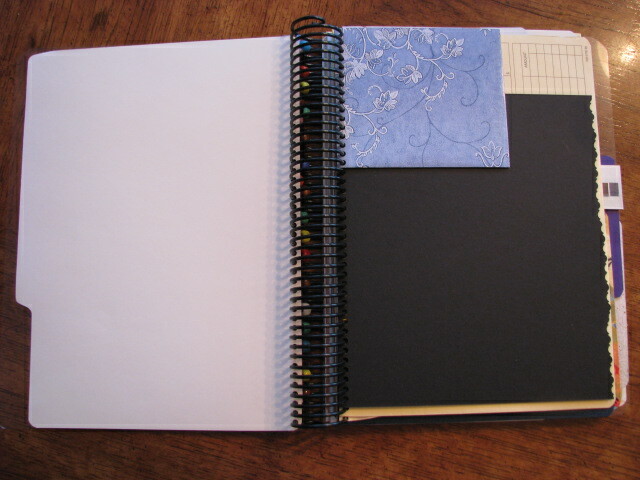 Page 2: A side of a tissue box and a piece of black cardstock. 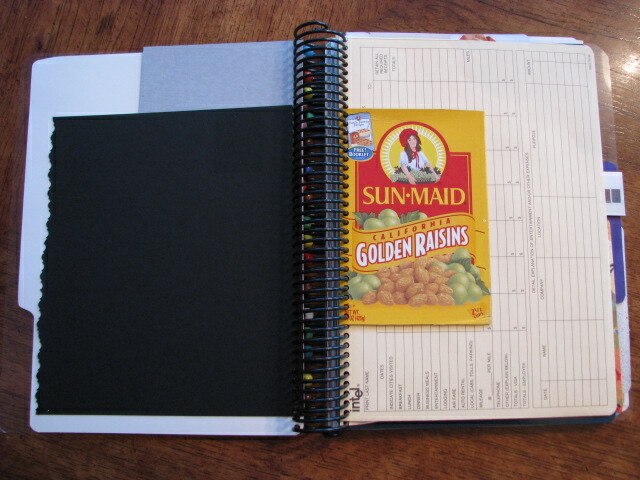 Page 3: Raisin box front and trip receipt envelope. Page 4: Half of an old kitchen clock face. Page 6: Color bar from the side of a pizza box. 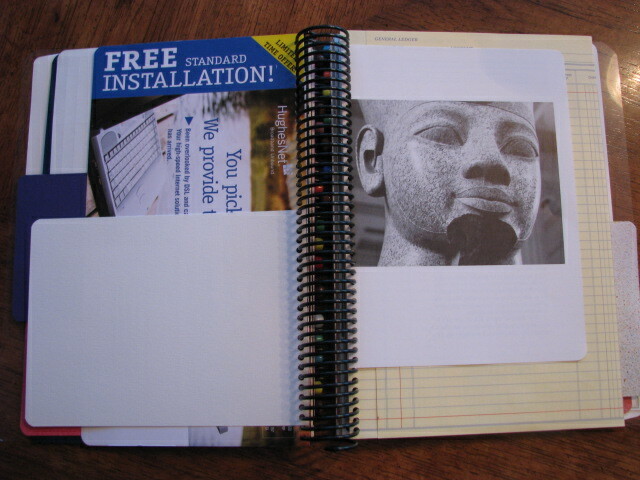 Page 7: Die cut cardstock (I bought a box of these at Goodwill). Page 8: Another piece of original background paper. Page 9/10: Miscellaneous ephemera (envelope from Holiday Inn, China and behind that a sheet of tab inserts). Page 12: Random art book page. 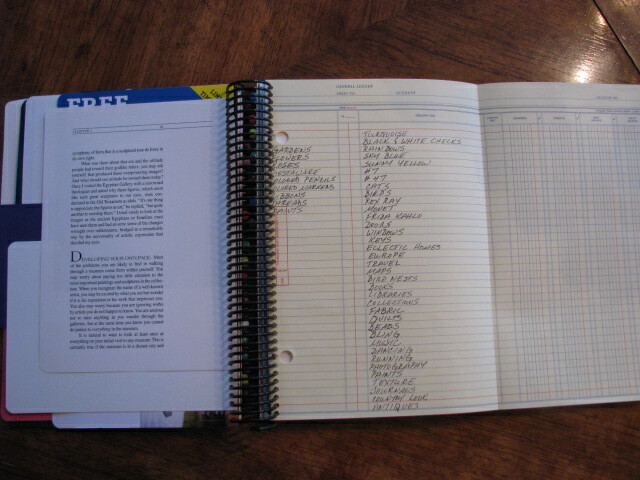 Page 13: An older ledger page that I used to make a list on. Page 14: One of my moo cards and watercolor paper. Page 15: Back side of a Hostess cupcake box, another side of a tissue box and a USPS Priority box side. Page 16: Liquid watercolor sprayed paper. 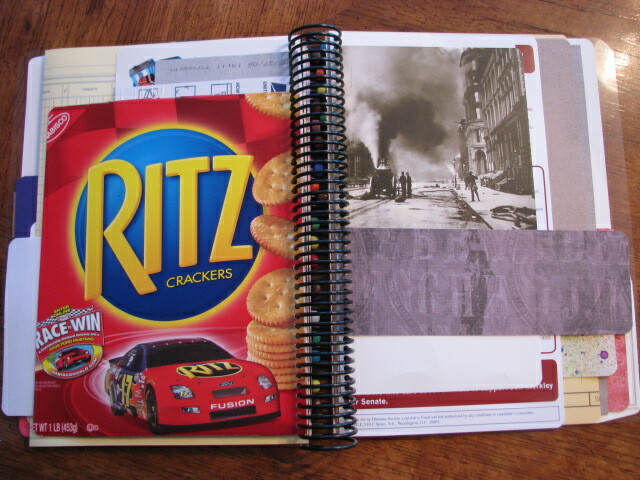 Page 17: Ritz cracker box front, cardstock piece and postcard. 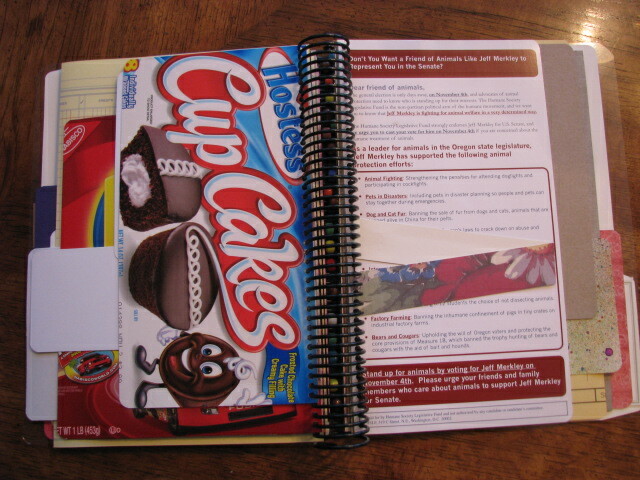 Page 18: Front of Hostess cupcake box, junk mail. 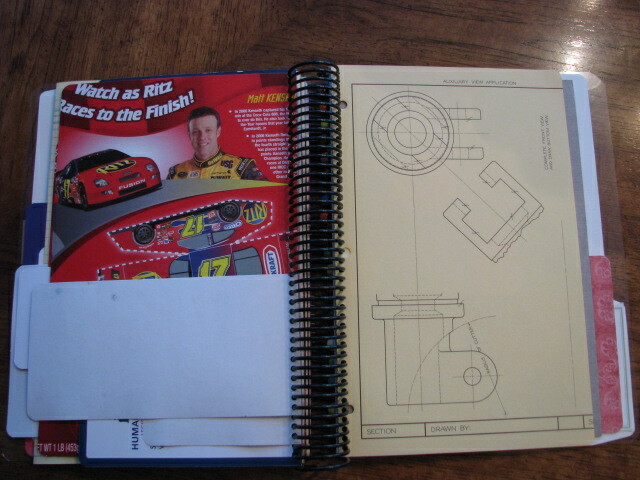 Page 19: Back of Ritz cracker box and old schematic drawing. 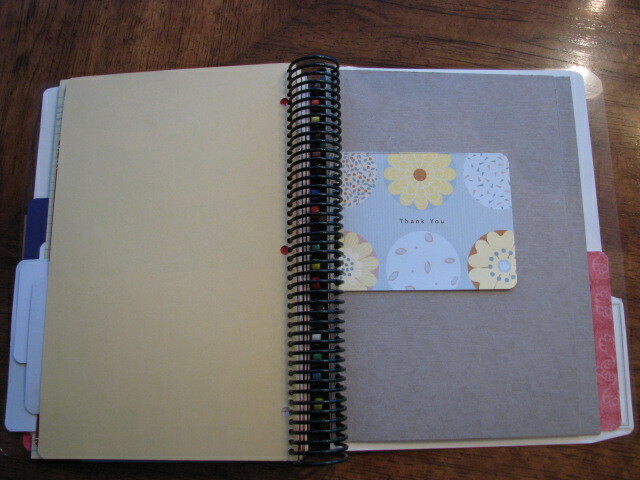 Page 20: A Thank You card. Page 21: Scrap piece of cardboard and a piece of cardstock. 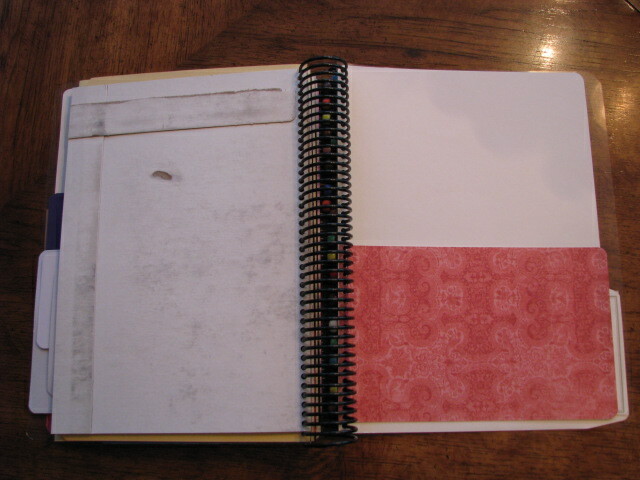 Back cover: Back side of the file folder that was used in the front with another piece of transparancy. Here lies the beginning of a new journal just waiting to be worked in, altered, drawn upon, painted, stamped, colored and journaled in. I can’t wait to get started. 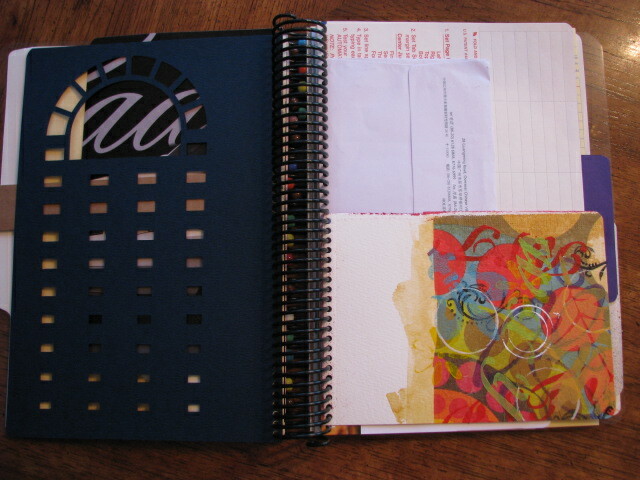 This entry was posted in 2008 and tagged art journal, recycle. Bookmark the permalink. Marci – How did I miss this post? I just saw a link to it from the Soul Journal group and popped over. This is so cool! I want to see it and I want to make one. Darn it – Doug just took the recycling. YOU have a rubi-coil?? I am so envious right now. I still have your empty books, missed you last Monday, but they will be there waiting for you. Hope all is well. This is just the kind of journal I would love to work in! Beautiful! This is an amazing project. I love all of the different every day finds that you selected. The different sizes, the different materials – your finished project will be so intriguing. I can’t wait to see where you go with this. It will be so fun for you! Thanks for sharing your steps. Marci..This journal is wonderful. I hope like the others that you continue to update us on the progress. 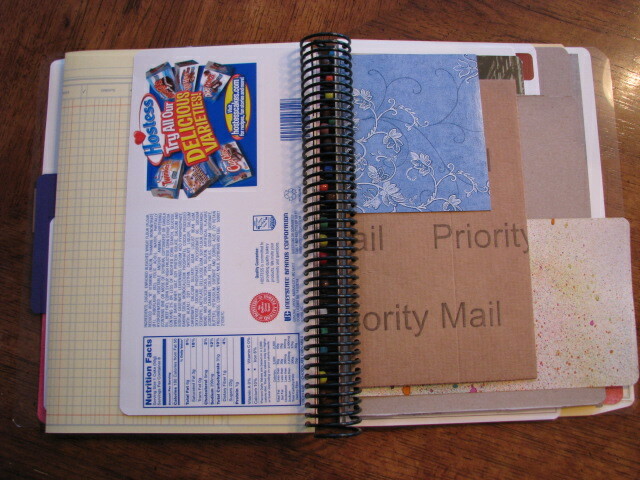 As it is I have an old binder that would probably work great for a project like this. I may even consider doing it. 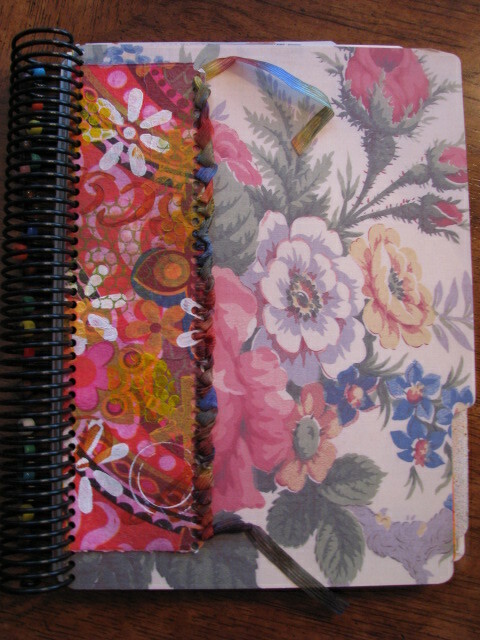 Marci I am working on my recycled art journal too! It is taking me a long time because I am painting each page. 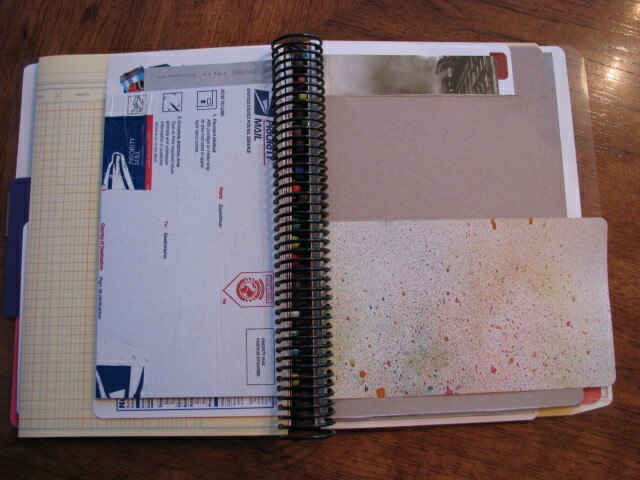 But after looking at your journal I now realize I should place in a few ‘unpainted’ bits in their original form. Your journal rocks! This book is super, Marci. The various shapes and textures will make for an awesome recycled art journal. I love the clock face. That was so original! You are a person after my own heart and I’m going to have to start something similiar (although I don’t have a binding machine) or I’ll lose my title of Queen of Free. What a great and unique journal! While all the rest of us are using boring same old same old, you are out there creating art within art! Congratulations – great work. Thank you for commenting on my sour cream container treat bags. I ABSOLUTELY love the book you made! I am stealing this idea. That is, if you don’t mind! Hi Amy! I took papers/cardboard and other pieces, cut them to size and them used the RubiCoil machine to punch the holes in each piece. 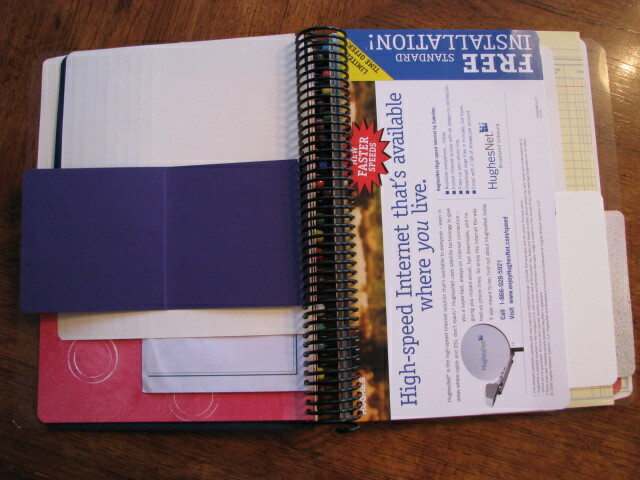 I then used a plastic coil to thread all of the pages together. I was a lot of fun to make and I plan to make many more. This is so neat! I love all the different layers and papers. How did you make it? What machine do you need? 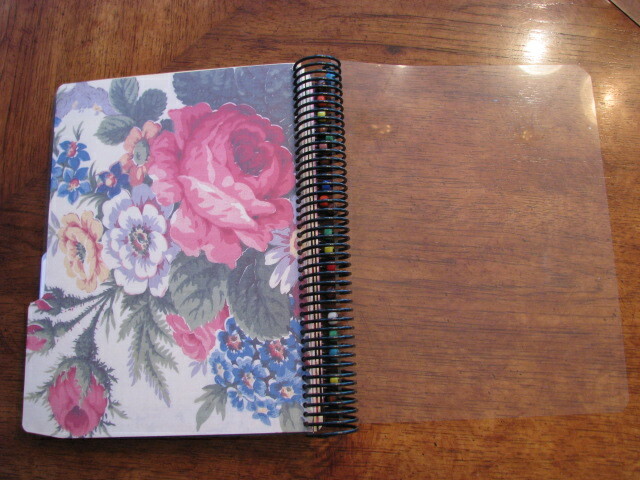 Marci, First of all I liked you pics of all the pages in your new journal! Is the clock face metal? What a god idea! Also, thanks for visiting my blog. It did feel good to get a page made. I always enjoy visiting your blog! This looks like a fun journal. I am looking forward to watching what you do with it!! i have been collecting too! i don’t have that cool tool! i know you can’t wait to begin to use it!!! I absolutely ADORE! this journal. I’ve done something similar on a smaller scale. I’ve reused/recycled papers for some small note books that I’ve made. 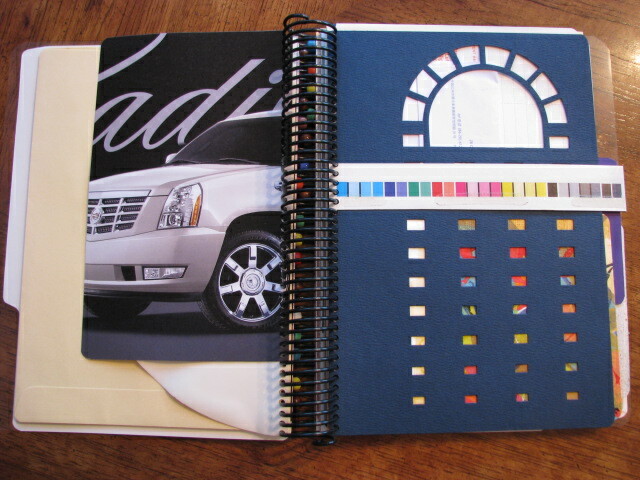 Color sheets, grid paper, copy paper, magazine pages, some scrapbook paper. So cool! I love that the pages are all shapes and sizes…I hope you will continue to share the ongoing progress of your book with us…I know it will be awesome. I absolutely love it. What a fabulous idea. So much fun. Can’t wait to see your first entry. This is WONDERFUL!! I bought one of these machines last year and haven’t even used it yet. NOW I’m really inspired. Thank you. Wow! I cannot wait to see how you transform this journal. Keep us updated … PLEASE! Wow Marci ! This is just too wonderful! I just love all the choices yuou made for your inserted pages. I think you will find that with such diverse backgrounds (and page shapes) that you would normally not use, that you come up with some very interesting ways of working on these pages. At least this is what I found in my journal. Can’t wait to see it when it’s finished. Please share it! Way to go Marci! Terrific results! 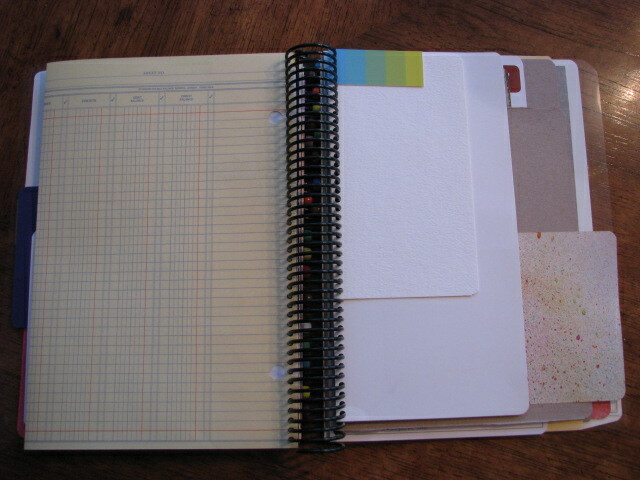 Why not try an old Looseleaf binder and a standard 1/4 ” hole puncher? That’s what I did and am rather pleased with the results. I love this journal. I wish I could make one like it. What do you use to punch the holes? 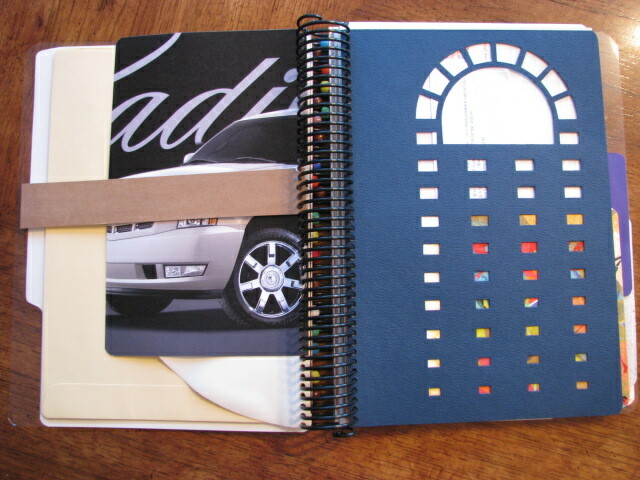 If I knew how to do this it’s the only type journal I’d ever use!